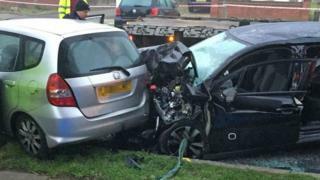 A 41-year-old has been charged after a man and a woman in their 70s died following a crash in south-east London. Ben Ord, from Eltham, has been charged with two counts of causing death by dangerous driving. The crash happened on Footscray Road, Eltham, just after midnight on Saturday. The man and the woman, who were in another car, died at the scene. Post-mortem tests are due to be held. Mr Ord has been remanded in custody and will appear via video link at Bromley Magistrates' Court on Monday.